Work out 0.8 + 0.6 =……..
Write down the number fourteen thousand seven hundred sixty? ……………. Fill in the missing number = 4683 = 4010+ …………. Write down two numbers with the sum of 9 and difference of 1? …………..
Write down all the factors of 25? ………………. I have Rs 40. I spent Rs 22.50 how much do I have left?…………………..
What is the value of expression x+10, when x=5? ………………..
What is the ¼ of 20? ………..
A plane journey takes 8 hours. If I set off at 9:40 am, what time will I arrive? ……………..
A piece of rope measuring 4m is cut into 8 equal lengths. How long will each piece be? 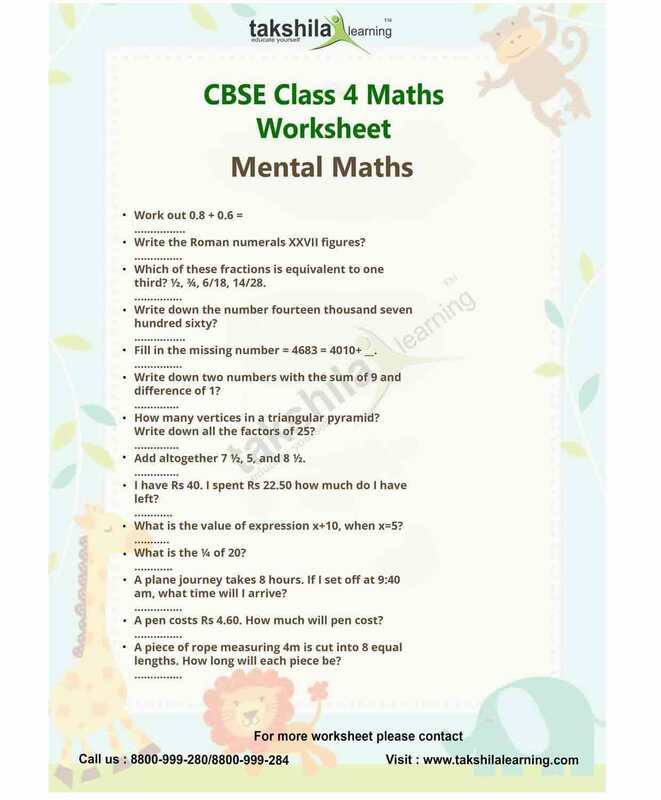 ……………..
For more worksheets of Class 4 Maths, register with Takshila Learning. Takshila Learning offers online classes for CBSE Class 4. Classes include animated videos, worksheets, activities, and encyclopedia, so that they can easily score good marks in exams. The entire content and worksheets are designed on the basis of CBSE Class 4th exam pattern. For demos CBSE Class 4 and for other classes, log in with Takshila Learning.